The first question to ask is are you injured? If not, no personal injury case can prevail. Simply being involved in an accident is not enough. The second question is who is at fault? If the other driver not at fault, then again, you will probably not be successful in a personal injury matter. The third question is how badly are you injured? Some injuries aren’t worth pursuing from a lawyer’s perspective because the amount of the recovery will not be sufficient for the time and effort applied to the case. In those situations, we always direct the client to file a small claims suit in which a limited amount can be collected. The final question and an optional one for the attorney is whether this case is worth it? Does it have the sizzle to convince a jury if needed of the damages that are desired? Is the client believable, and given all that, is it worth the cause of justice? That’s a deeper question but it’s something to ponder and discuss. All cases are not worth going to court and therefore discussions on settlement should be considered. What Can Someone Expect From The Other Side Once A Claim Has Been Filed? You can expect a call or visit from an insurance adjuster. Two claims may be going on at the same time. One will be for the property damage, if applicable, the other will be for the injury. The adjuster will attempt to commit you to a taped statement about the incident. You read my admonition about doing so. The adjuster will also attempt to get you to sign medical release information so they can retrieve your medical records. The easier way to handle this is to inform the adjuster that you have an attorney and all questioning must cease. The adjuster then can work with your attorney to acquire the needed information. The least you talk, the better your chances are at recovery. For all the reasons, I spoke of above you should consider this advice. The insurance company’s code of regulation and policies prohibit communication with a claimant, once they know that an attorney client relationship exist. Do not voluntarily give a taped/recorded statement to the insurance company without your attorney being present. How Important Is Evidence In A Personal Injury Claim? Evidence is critical. Insurance companies are professionals at attempting to minimize damages awards to clients. A good witness to the accident will help as well. Many Evidence is critical. 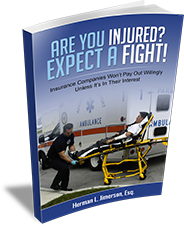 Insurance companies are professionals at attempting to minimize damages awards to clients. A good witness to the accident will help as well. Many times, there are multiple versions of the accident and a good witness can resolve liability in the favor of the client. We attempt to make sure that we get all the names of the witnesses to interview them thoroughly to get their memory recorded properly so that it won’t change in the time that it takes to go to trial on a matter. Evidence is the weaponry of a successful injury claim. The more you can prove through evidence, the better your chances are at winning the battle. Witnesses are weapons too. The caveat is that this is not necessarily a game of numbers. More doesn’t necessarily mean better. Evidence and witnesses must be believable. If not the chances of success drops dramatically. Most lawyers will tell you that it’s better to have a little “believable evidence/witnesses” than a lot of less believable stuff! How Soon Should Someone Seek Medical Treatment After An Injury? If injured seek immediate medical attention. Waiting too long weakens your case and gives the insurance agency the argument that the accident didn’t cause the injury. However, some injuries do not become obvious until later. The question will be whether that injury was “caused” by the accident. Causation is a legal term and best left to the lawyers and the doctors to argue over. I do warn people the longer someone waits makes their case less appealing to lawyers. The primary reasons is what I stated earlier, but a practical reason is that if there is an unreasonably delay in treatment going to a jury trial becomes more likely. That means the expenditure of money for trial preparation and the likelihood of not recovering the money expended. The last question is how long is too long. The answer is it depends. Consult with an attorney immediately, even if you believe it may have been too long. You deserve an honest answer. Besides what one attorney may seem too long, another attorney might find proper causation for the injury. For more information on Viability Of A Personal Injury Claim, a free initial consultation is your next best step. Get the information and legal answers you are seeking by calling (314) 786-3536 today.